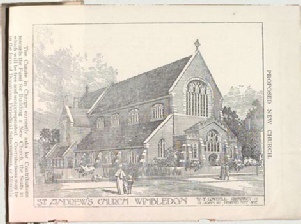 History of St Andrew, South Wimbledon. itself a daughter church of St Mary's Wimbledon. Holy Trinity recognised the need to have a new mission hub in the growing south side of Wimbledon. The Mission Church opened for service on Trinity Sunday, 20 May 1883. The first verger was appointed in October 1885 and the first choirmaster, Dr. Parsons, was appointed in November 1886. The permanent church building, constructed in 1908-9, is a substantial brick and stone basilica designed by William Henry Lowdell, and consecrated by the Bishop of Southwark on 25 September 1909. In 1910 St. Andrew's was made a parish in its own right, with Joseph Maunders as the first Vicar, and has sought to bring the good news to the area ever since. In recent years St Andrew's has had a long ministry served by The Revd. Dr Andrew Wakefield, who sadly passed away in October 2016. This was a great sadness for the congregation and the local community, as Andrew was well respected and loved. His brother received the freedom of Wimbledon awarded to Andrew after his death.